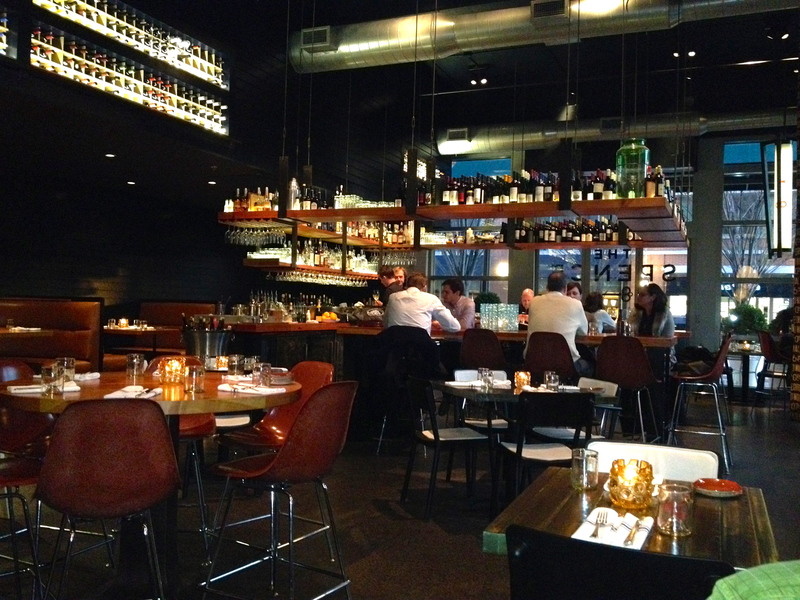 When we see the words “hot and trendy” on Atlanta restaurant lists, The Spence is always included. 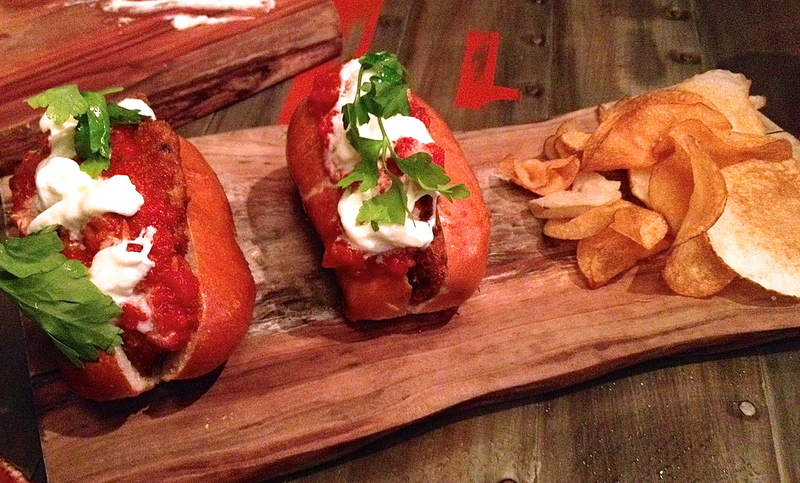 It’s the brain child of Chef Richard Blais, who also brings us Flip Burger. Blais has become an Atlanta celebrity, finishing second on Top Chef and winning Top Chef All-Stars . Will The Spence become “top chef” on the date night list? 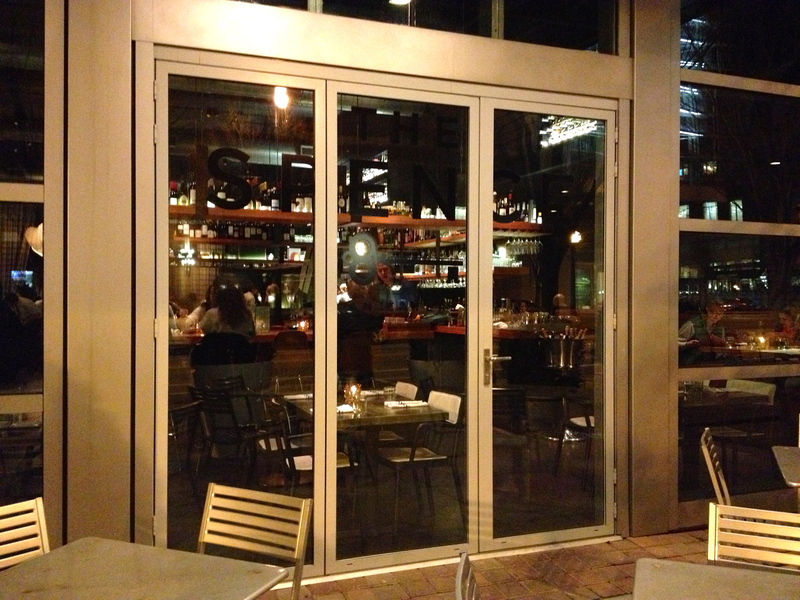 Easy to miss from the outside, but don’t miss the food on the inside. The Spence is located on 5th Street, right in the middle of the new part of Georgia Tech. We Georgia Bulldogs feel funny on the Tech campus, but we know at these prices the only Tech students here are out to dinner with their parents. We arrive early for our 6pm reservation and at this hour there is no crowd and we are seated right away. The drink menu features a long wine list and only 8 beers, none of which are on draft. That’s okay because the 8 beers available are all craft offerings. 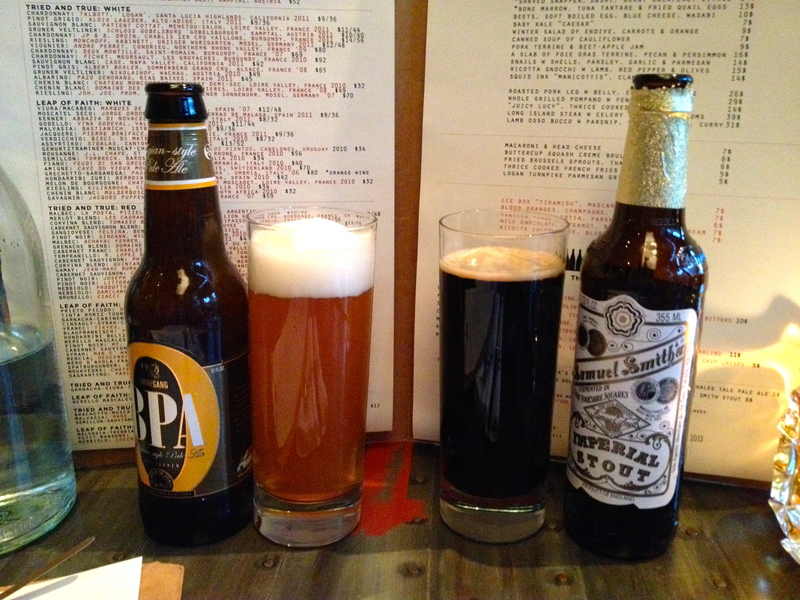 Eve chooses the Ommengang Belgian IPA, and I go for the Samuel Smith Imperial Stout from England. Cold beers for a cold night. The Belgian is not as hoppy as normal IPA’s due to fruitier hops. It is a fizzy beer that must be poured slowly, or suffer the consequences! The stout is different from other English stouts as it has a lot of roasted malt, which gives it a more hoppy-like flavor. The trendy tables around the trendy bar. “Spence” is another word for pantry and every night Chef Blais looks on his shelves and formulates a new menu. There is an interesting array of ingredients on tonight’s menu, some of which we would never eat, and some we can’t wait to sample. Our waiter Adam expertly guides us through each offering without ever looking at a menu. We pass on the bone marrow, but take a walk on the wild side ordering the sweetbread parmesan topped with burrata cheese and served with home made potato chips. It’s a culinary first for both of us and tastes almost like fried chicken livers. 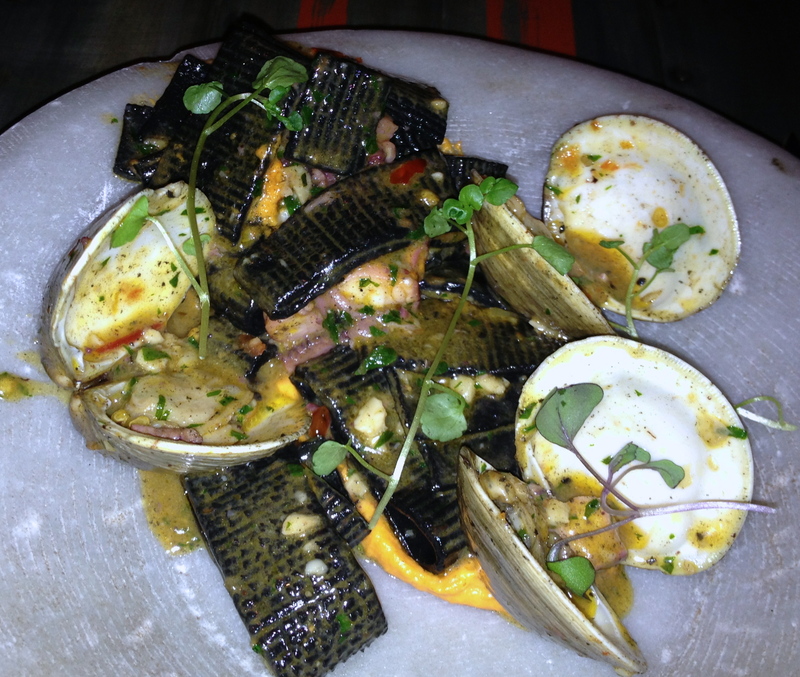 We consider our first course a success and order a small plate, the squid ink manicotti with steamed clams and octopus. Black squid manicotti. It packed a little kick. The squid ink turns the pasta black but there is nothing dark about the taste of this dish. The in-house pasta is light and cooked perfectly, there are only 3 clams but they are meaty. The orange sauce has a kick and the taste buds are now on full alert. In the middle of the dining room, sits a wood-fired grill and oven. Lots of wood. They burn it and serve on it. 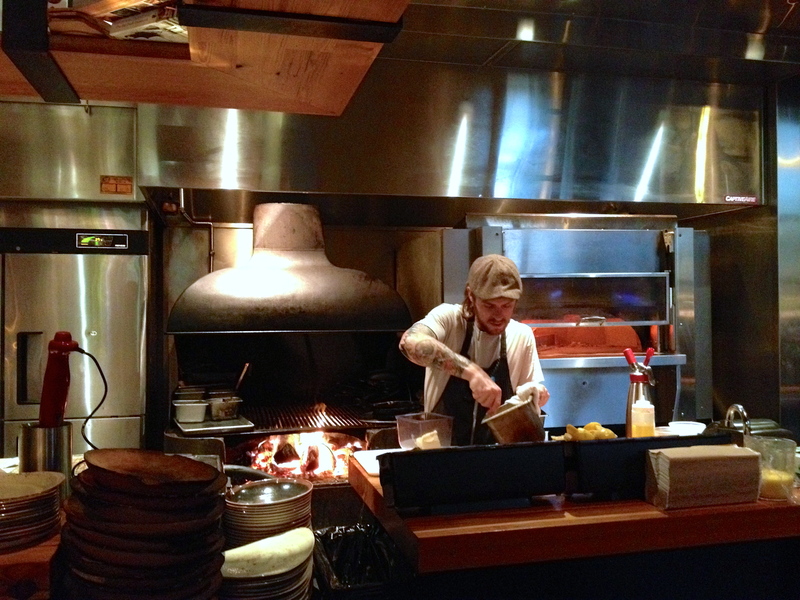 Their heat keeps us warm on this cold night and the smell of the burning wood makes us want to order something grilled. Say hello to Juicy Lucy. Juicy Lucy. 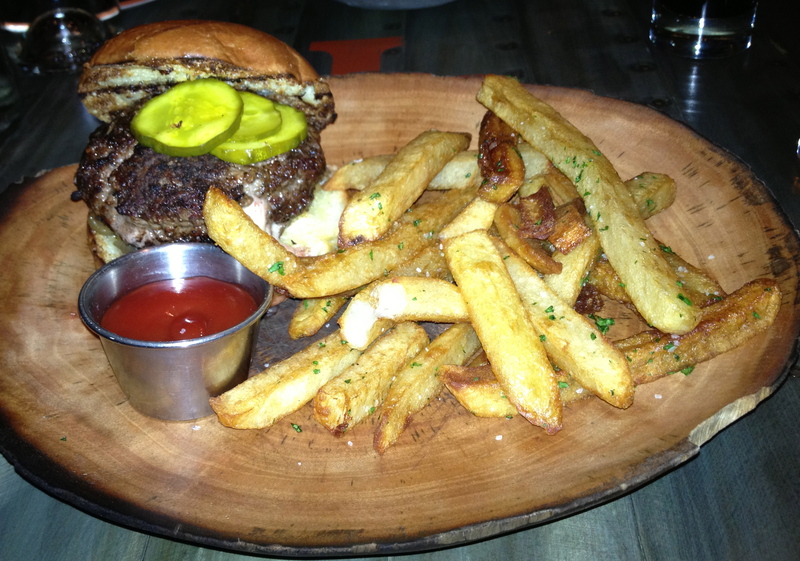 Check out the wood plate and the thrice-cooked fries. Lucy lives up to her name. This succulent burger is perfectly pink on the inside and the cheese is in it, not on it. 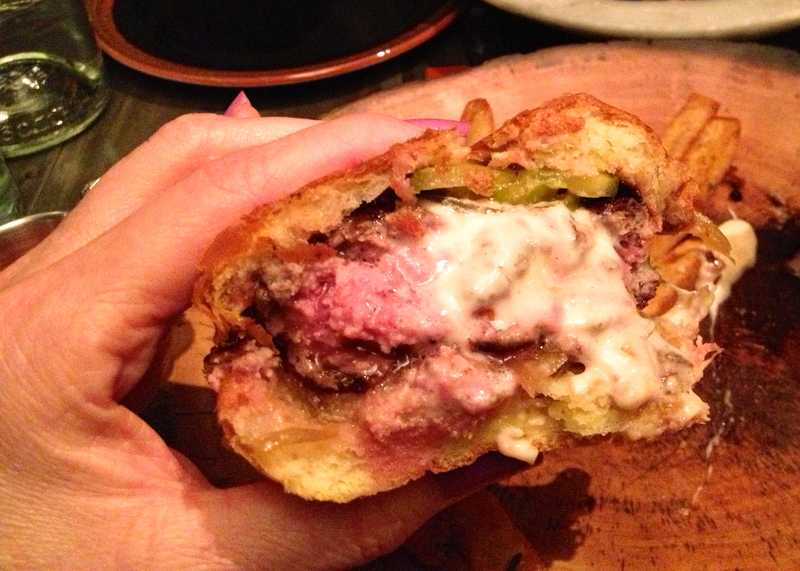 See how juicy Lucy is. The fries are thrice cooked, we don’t really know what that means, but they are darn good. Our waiter has high praise for the Brussels sprouts which as you may know have become our new favorite vegetable. 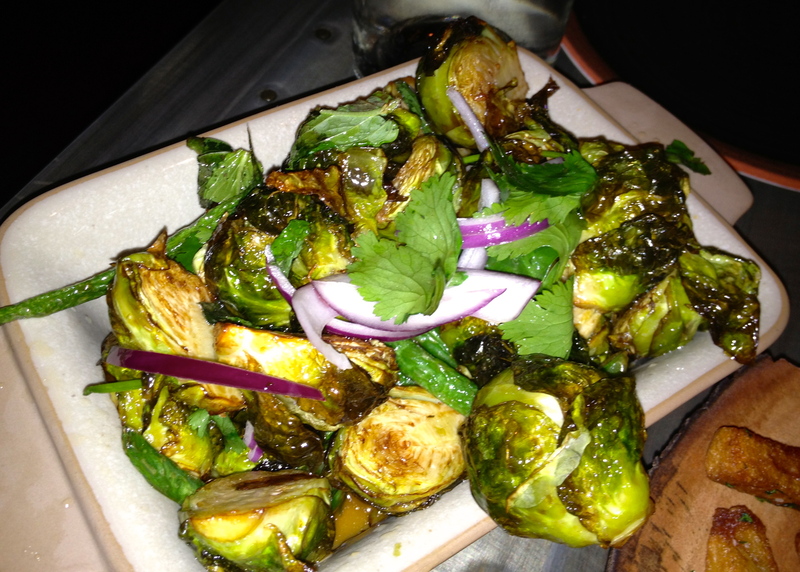 As sprout connoisseurs, we can report that although these are excellent, they are not the “best Brussels in the city”. Brussels sprouts. We liked the green beans in the dish too. The Thai sauce is a nice touch, and reminds us of the Asian flavoring of the Happy Belly food truck, which we feel cooks Atlanta’s best sprouts. We are pretty full at this point but we see some desserts go by and we are tempted to try one. Cue Adam with descriptions that have us drooling and ordering the milk chocolate with burnt banana ice cream. It’s a perfect presentation for sharing. 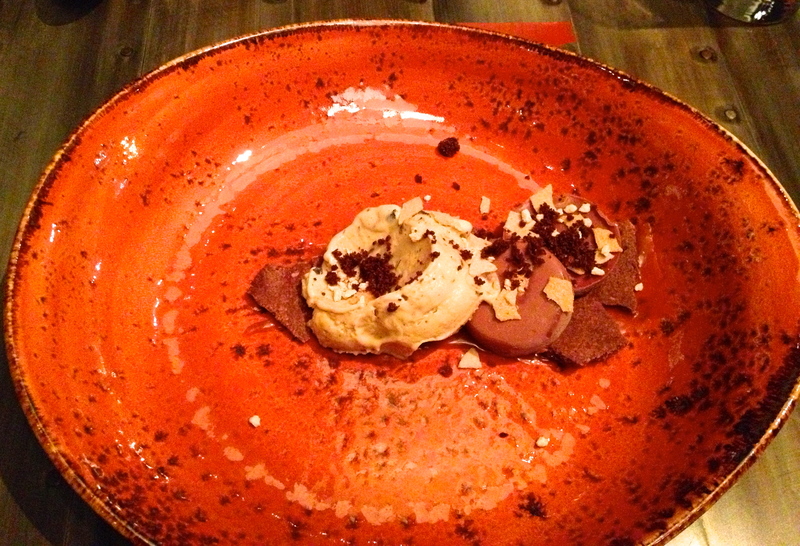 Two chocolate medallions with peanut brittle and a small scoop of creamy ice cream that doesn’t taste burnt at all. This is a great finish to the meal and the best dessert we’ve had in months. Dessert after. 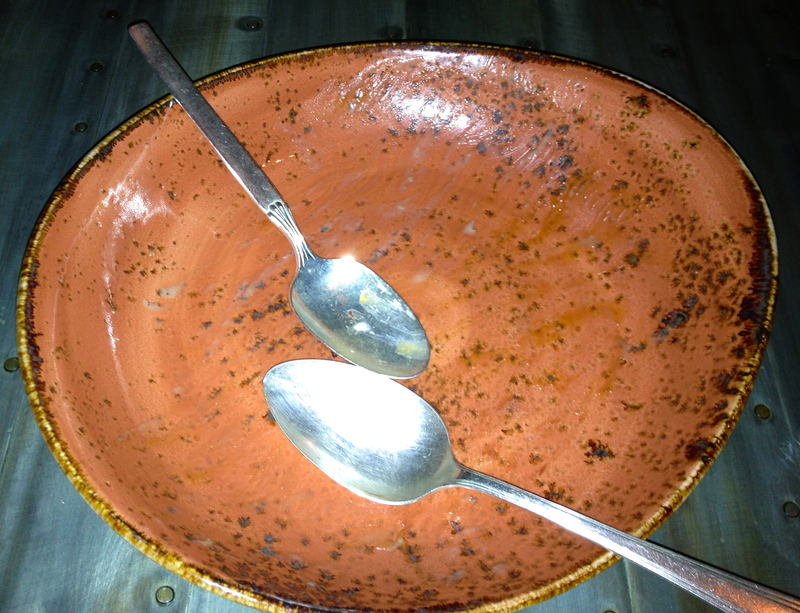 It was so good, we scraped the color off the plate! 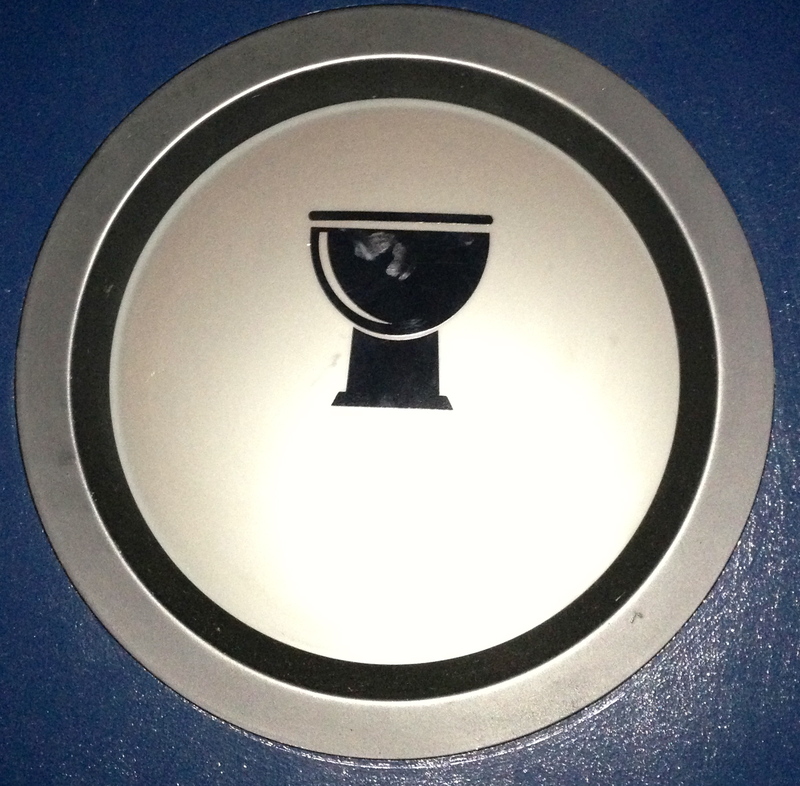 We do such a thorough job scraping the plate that they do not have to wash this dish. 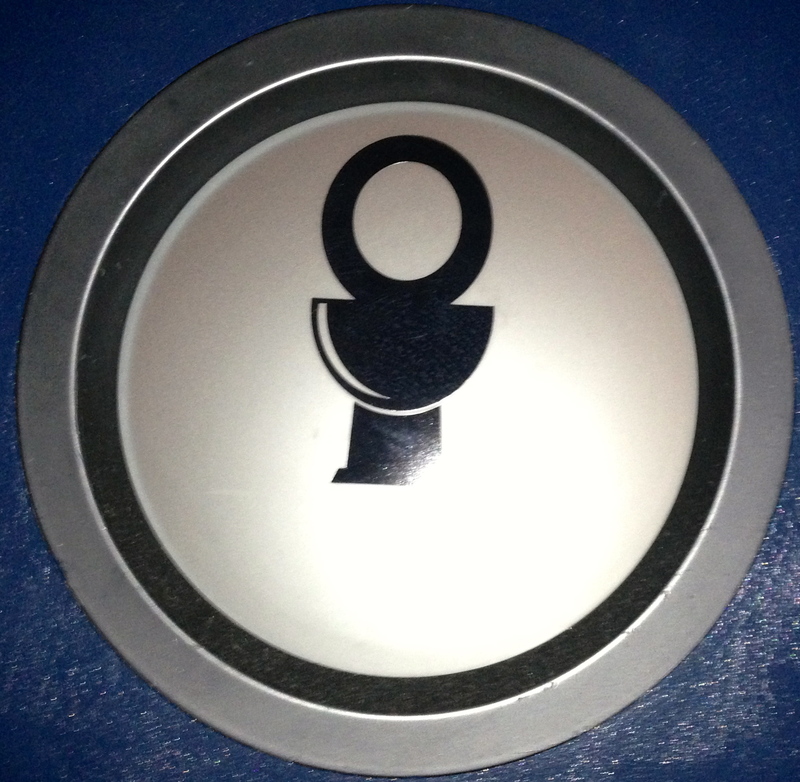 Before we go, check out these signs if you have to go. Be careful when making your selection so you don’t choose the wrong door. As we leave we can’t help but notice how crowded and loud the room has become. The place has really filled up over the last hour and we suspect there will be many more happy customers before the evening is through. If you go, here is a tip: park in the deck in the back and bring your ticket in for free parking validation.